My primary intention this year is to stay focused on my art. I am determined to push my self-imposed limits and work with mediums unfamiliar to me. Carving rubber was always something I thought about, but never attempted. Guess what? I found I CAN do it. But more than that - I find that I love it. The smooth carving of the rubber helps with my stress level...and it takes me away when I am involved in the process. I need that. Many of us do...for some artists it's knitting or crocheting, for me its the rubber. SnapShot is my latest attempt at carving. 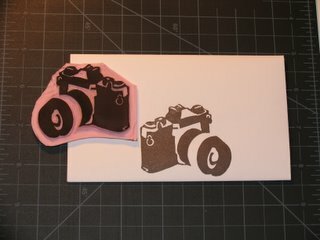 Photography is another hobby of mine, so of course I needed a camera stamp! HEY! I think it's great that you've found a positive stress reducer. Who needs pills?! BTW, you carved out my camera! Oh wow! How rude of me. I forgot to mention that I LOVE your new stamp. Looks like you had to carve alotta rubba!